And click here for incredible shots of the Iron Hands in action! Unlike my other scouts, I wanted the Iron Hands models to look less "frilly", and replaced the original arms with some bare arms (which I got off little toy pirates, of all things!). I equipped this guy with two bolt pistols- Blammo! In addition to the bare arms, I removed the mohawks for a bare headed look, and gave all the models black gloves too. 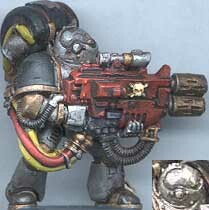 This heavy bolter is from the new metal scouts- I spliced it onto an old scout and used a backpack from a Necromunda heavy to keep the model balanced! 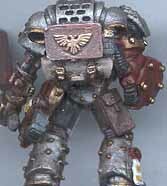 I converted one of the new metal scouts for my Iron Hands scout Sergeant. The bionic arm is from a bounty hunter. All the scouts have been painted steel (armor), brass (trim) and black (cloth). 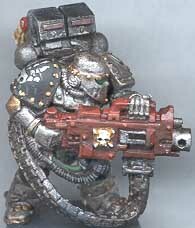 The metallics were washed with dark brown for that grungy look. 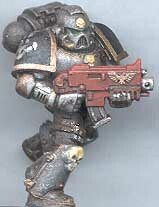 According to the official Space Marine background, the Iron Hands are supposed to be "Yet Another Black Color Scheme" chapter (I can think of at least 6 already). 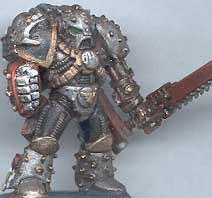 I opted for a metallic color scheme instead, based loosely on GW's Iron Warriors and Silver Skulls. 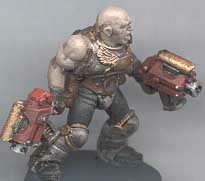 The brown wash "rust" effect can be clearly seen on this guy's elbow and chest. I used modified plastic Khorne Berzerker legs to get the running pose. In our campaigns, we allow heavy stubbers as special weapons, so I had to cook one up- by splicing two Ork Shootas together and adding a targeter to the top. 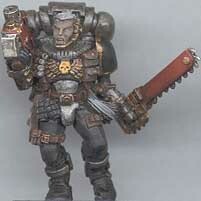 This guy also uses a Berzerker chest and legs for that "heavy" look (minus the pointy, chaosy bits, of course). We've also made provisions for "two fisted" pistol use, as seen here. 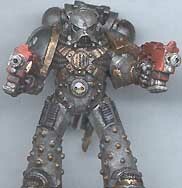 As most of my Iron Hands, I 've used "historical" armor for it's heavier feel. (Check out marine armor history at this fine site, and call mail order for these early models). This is a Mk. 5 armor with plastic arms. 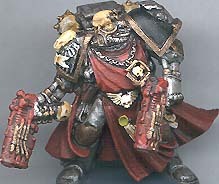 The steel, brass and black colors really look great with the heavier armor. 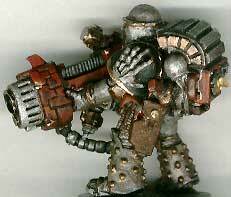 One popular rumour of the Iron Hands is their liberal use of bionic arms. My sergeant, a converted Mk. 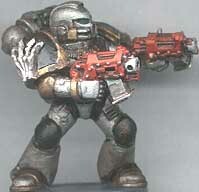 5, is equipped with a bionic arm made from a part from a Pit Slave Leader miniature. The Power Glove is from an old Mk. 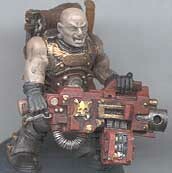 6 assault marine. The hand on the shoulder pad is a plastic zombie hand, btw. 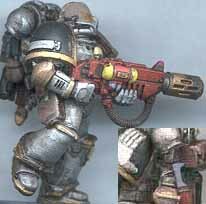 Another way to make a marine look heavier (other than their armor style) is to load them up with equipment. While it's true that marines rarely spend long periods of time in the field, the Iron Hands have been rumored to be masters of siege warfare, so I've loaded my sergeant up with a holstered bolter, eagle box, and tarp from the attack bike metal bits, plus a plastic pouch on the leg..
Another historical armor- this time, a Mk. 2 "crusader" selected for his turned-head pose. I somehow spliced this all-metal marine together with the all-metal parts from the Heavy Bolter devastator (using a plastic arm, and repositioning the ammo feed port on the backpack to get it all to line up). Yet another example of heavy loading. The gear hanging from this marine's pack is part of a backpack from a plastic Warzone miniature (now out of print). Stick grenades, cannisters, pouches, and a knife all help to make the marine feel less like a "toy" and more like a warrior. A conversion (madness) of the Limited Edition captain, replacing the left shoulder with plastic parts to get the right pose. 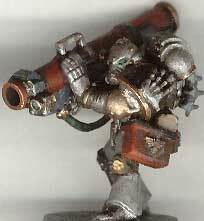 Desperate for bionic arms, I stole from the Cmd.Squad Techmarine and from a metal Vet. Sergeant! A pair of Chaos Plas. pistols complete the conversion. The back of the captain. I stole Azrael's backpack (minus banner) for character- plus the studs in the skulls keep with the studded look of the Mk. 5 marines. 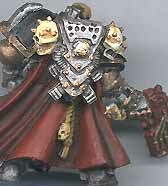 For the Iron Hand symbol on the shoulder, I used a plastic marine hand. Compared to the other models, the captain is lightly equipped- it gives him a more matter of fact, "get down to business" look. While on the Melta-gun kick, I used the plastic meltagun off the new Space Wolf accessory sprue on this guy. Using Berzerker legs, I gave him a running pose. The right shoulder uses a marine hand (see insert), flattened out and glued onto the pad (getting the thumb flat is tricky). I also geared up the pack again for the heavy look. 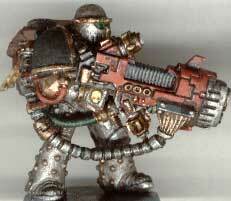 More Heavy Weapons, this time a Heavy Plasma. This time, I started with a Mk II crusader armor upper torso, rather than just using the head, and added it to some Mark V legs. The end result swims with detail- I love it! Although the head is "fixed", the gun ends up aiming out in front more than to one side, so the pose looks pretty natural. The power supply backpack is quite bulky, so I didn't add as much extra gear as I usually do, just a holstered bolt pistol and some pouches. The legs on the historical armor are chunky enough to make the whole thing look balanced, amazingly. The hand on the shoulder is a zombie hand- I go back and forth between using these and the marine hands- variety is good, right?. 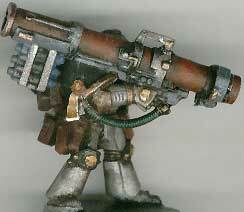 I was always a fan of the "classic" missile launcher from the Rogue Trader era, but one must keep up with the times. The 2nd edition style was too plain for me, and looked very unbalanced. The 3rd edtition was well posed, but too small and had no mag. So I spliced 2nd. Ed. parts onto a 3rd. Ed. body to create this beast. 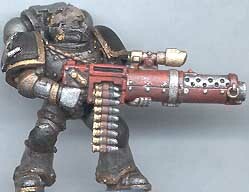 Now THAT'S a heavy weapon! In addition to the 3 shot rack added to the backpack, I gave this guy a sizeable ammo box to ensure he had plenty of ammunition. The body is a metal Mk. IV marine, with the plastic 3rd edition arms attached. The head was already turned just right for the pose. With some trepidation, I painted the body of the missile launcher dark red, but after putting the black wash on, I was very happy with the result! This little fella shadows my Iron Hands, ensuring they always have enough ammo! I removed the head from an ork "runt" carrying a shell, and replaced it with an escher juve head. I added a chopped Eversor backpack to complete the model.